In the past week, Syria’s rebels — notably the faction Jaish al-Islam — have attacked the Islamic State near Damascus, trying to remove the group from suburbs north of the capital. After giving Islamic State fighters 24 hours to surrender their arms, rebels fought those who refused in Barzeh, Tisreen, and Qaboun. Scores of militants have reportedly been killed or captured, leading Jaish al-Islam to declare a successful completion of the operations. While the offensive is effectively a counter-attack against the Islamic State’s high-profile invasion of Yarmouk in southern Damascus earlier this month, they have roots in a battle which has developed for almost a year. Initially, the fight between different rebel factions and the Islamic State, which started in January 2014, did not reach the Damascus suburbs. But in July, Jaish al-Islam — based in Douma, northeast of the capital, and the largest faction in the East Ghouta area — declared war on the militants, accusing them of a series of attacks and assassinations. The Islamic State was easily defeated, with the majority of its few hundred fighters killed or captured. However, the remainder of the fighters made their way to Barzeh and Qaboun. They benefited from the relative quiet of a truce between rebels and the Assad regime, agreed in January 2014 after a siege of almost two years by the Syria military, which also secured food supplies. Meanwhile, to the south of Damascus, the Islamic State recovered from the loss of their positions to consolidate in the district of al-Hajar al-Aswad. From that base, they were able to send hundreds of fighters north into Yarmouk, home to about 15,000 Palestinian refugees, and seize more than half the area in the past two weeks. 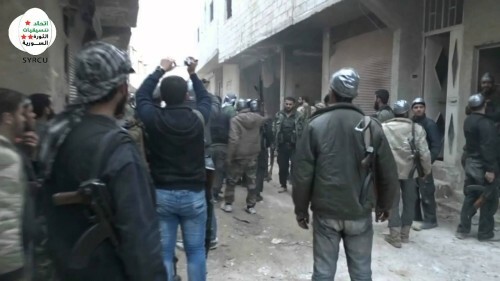 Jaish al-Islam joined other rebel groups in trying not only to challenge the Islamic State in Yarmouk but also to attack it in al-Hajar al-Aswad. At the same time, Jaish al-Islam decided to remove the threat from the northern suburbs. Now a bigger challenge looms. Jaish al-Islam and its allies were able to win quickly in the northern suburbs because they were close to their strongholds in East Ghouta. Challenging the Islamic State in south Damascus requires manoeuvres around the regime siege which has cut off many opposition-held areas, as well as confronting the largest concentration of militants. The rebels will have to find the forces and supplies to contend with both the militants and the Syrian military.